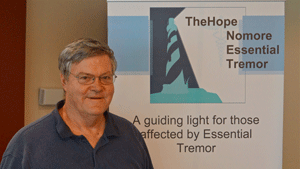 One of HopeNET’s objectives is to increase awareness of Essential Tremor (ET). There is a tremendous need to increase awareness of ET, because even though it is the most common form of tremor, few people know what it is. Many people confuse Essential Tremor with Parkinson’s Disease, which almost everyone has heard of. Without greater awareness, Essential Tremor will not get the needed money for research that will lead to better treatments and ultimately a cure. It is a daunting task to increase awareness of a condition that so few know exists. Our strategy is to focus our efforts, targeting specific groups rather than attempting to reach out more broadly. From our experience, the greatest need for increased awareness of ET is with doctors. It is logical that doctors be a top priority, given that many doctors don’t understand Essential Tremor and its effects on those who are suffering from it. Another important target group is people who are involved with children—such as parents, educators, school nurses, and the like. Unlike Parkinson’s, where the onset of the condition is rare before age 55, Essential Tremor can present at birth or during early childhood. The effects of ET can be devastating on a child’s self esteem, and the psychological damage that results can last a lifetime. Among many people who know they have Essential Tremor, there is a sense of hopelessness. In the U.S. today there is an expectation that going to a doctor will result in improvement of just about any condition. Yet today, the most common ways that doctors treat ET are the medications Propranolol (Inderal ) and Primidone ( Mysoline) and the surgical treatment Deep Brain Stimulation (for severe cases). The medications were originally designed for other conditions – in the former case as a beta blocker, and in the latter case as an anti-seizure medication. It is therefore not surprising that the drugs don’t work at all when prescribed for about half of ET patients. In the other half, there is usually only partial improvement. Complicating the situation are the frequent negative side effects that accompany these drugs. Doctors frequently minimize Essential Tremor, not realizing the extent of the effect it has on the person who has the condition. My own case is sadly typical. I was told by a neurologist who was treating me that I shook a little and that it wasn’t a big deal. He gave me a prescription for Inderal and said goodbye. The visit lasted three minutes. As I left, I was very annoyed. If it wasn’t a big deal, why had I gone through hell as a plebe at the Naval Academy? An upperclassman felt I wasn’t officer material because I was too “nervous.” In another case, I lost my job as Director of Strategic Planning at Ridge Tool, specifically because of an incident in which my voice tremor became quite pronounced as I was making a presentation to senior management. I know that I am not alone. I have been told many similar stories during my years working to support those with ET. The onset of my Essential Tremor occurred while I was in college. I went 33 years without knowing I had the condition. It was a relief to finally know the cause of something that had had such a detrimental effect on my life. It was also good to find out that it wasn’t something I could control. I inherited the condition. Many others have shared with me the relief they felt in finding out that there was a name for what was affecting them. Unfortunately there are still many people today who have ET and are unaware of what it is—which causes unnecessary concern and worry. As I have stated earlier, Hope is at the core of HopeNET. Many people with ET have little hope. Many have given up on the medical community , having gone to doctors expecting help and getting none. However, the situation is improving. The first drug specifically designed for ET is in the works. There also is a new surgical treatment being tested. There is great excitement among people with ET who have heard of these new treatments. I believe that this excitement stems from not only the possible benefits, but also from the hope of being offered something new, after years of frustration and disappointment.